This made me think of my friend, Jan Vaine and her book, The Art of Elegant Hand Embroidery, Embellishment and Applique. No matter what your style is you will be amazed with the workmanship and detail of every aspect of this book. The design elements along with the clear step by step illustrations makes this book a thing of beauty as well as a valuable resource tool. All images courtesy of Landauer Publishing. Judy Severson, Elly Sienkiewicz, and Jane Townswick, to name only a few. What could I possibly offer students? After discussions with Bette Augustine, the Administrator of the Appliqué Academy, we decided to offer a class on embellishment techniques for the album blocks. With Elly’s permission, we chose one of her newly introduced 8” blocks from “Baltimore Elegance”, Lovebirds in Wreath. With this block as our goal, I offered students the opportunity to learn embroidery and embellishing techniques to make their appliquéd blocks sing! The response and enthusiasm of the class spurred me to gather stitches and techniques that could be used to add life to appliqué and piecing. Over the next several years, students’ enthusiasm grew even more, inspiring me to offer the collection of stitches and techniques found in The Art of Elegant Hand Embroidery Embellishment and Appliqué. How did you determine what to include in the book? Why multiple techniques? Quilters and appliquers are very visual! As students, it follows that most of us are also visual learners. Over the years of teaching classes I have learned handouts, along with the actual demonstration of the teaching techniques and the student’s hands-on stitching, helps them learn and grasp the application. I developed a method/process of preparing a workbook for students with stitch page instructions. On the left side of the workbook is the instruction page and on the corresponding right side page is a blank piece of fabric. We use this fabric page to learn how to make the stitch. Then we experiment with the stitch, using different mediums of threads and ribbons and fibers. We note under the stitch the fiber used, for example 3 strands of cotton floss, or 2mm silk ribbon. 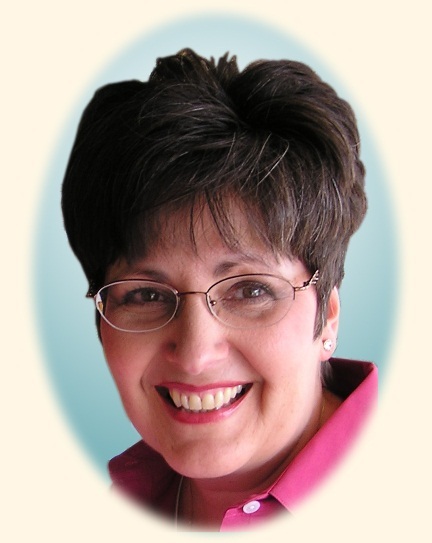 As we work through the workbook, what begins to emerge is an invaluable reference tool. When we desire to add stitches to appliqué or even a pieced quilt, we have pages of sample stitches to choose from, or a sample page to try a new thread or stitch for the desired result before we add it to the actual block or quilt top. So I took the workbook idea one step further and gathered stitches and techniques that I thought could be used to embellish or enhance appliqué and put them into one resource book…embroidery, fabric techniques, ribbonwork, and stumpwork…all working together. In my previous post I talked about going to the quilt show and what kind of quilts yu are “drawn” towards. This made me think of my friend, Jan Vaine from the Graham Cracker Collection and her new book, no I mean master piece. The Art of Elegant Hand Embroidery Embellishment and Applique. How many blocks and techniques are included the in the book? There are 100 4” blocks, 20 8” blocks, and the 16” center block and swag. They are all in individual pdf files on a DVD included in the back of the book. For those who prefer their patterns in a paper format, there is also a companion pattern pack available, which includes all of the blocks as paper patterns, along with a booklet including transfer instructions, a listing of each block, and the suggested stitches to create the individual block. As for techniques, there are 62 embroidery stitches, 10 fabric techniques, 20 ribbon techniques, and 8 stumpwork or raised surface embroidery techniques. Did you stitch all the blocks? My goodness, no. In fact, very few blocks include my stitching. In order to meet the publishing deadline, 34 ladies and one gentleman graciously offered to stitch blocks for the quilts and book. Without their willingness to offer their skills and time, this book would not have been possible. How did you coordinate the stitching of all these blocks? The story of how all these blocks came together is truly amazing. Each stitcher chose their pattern(s) and then received a piece of background fabric, a color swatch of a red, green, gold, and white, and some suggested stitches. The swatches offered the colorway of the proposed quilts. What was so amazing was watching the blocks return from China, Ireland, and across the United States, all beautifully coordinated for making the quilts presented in the book! I could not have planned each individual block better to fit within the four quilts. Stitchers’ skills ranged from highly experienced needleartists to first-time stitchers. The gentleman mentioned earlier was my Dad. My Mom taught him to stitch his blocks, and he worked diligently to perfect his technique. He stitched four blocks, and I am thrilled they are all part of the book and quilts! My niece was also a first time stitcher. She was far from home, living in Ireland at the time, and had never embroidered. So the task was set to teach her the stitches and techniques to complete her two blocks, via letters and emails. With only written instructions and hand drawn illustrations, she completed two exquisite blocks. My Mom and two sisters, living miles away in Pittsburgh, PA, were incredibly helpful having stitched numerous blocks between them in order to bring the quilts and book to fruition! The local Jacksonville “gardeners” were such an encouragement and blessing throughout the entire process. We would meet for lunch at least once a month, learning new techniques and looking at ideas as they worked on their blocks. Some of the stitchers even taught me a few new tricks. It was fun and inspiring for all of us! read about master gardners, here. Other long distance gardeners hailed from California, Colorado, Minnesota, Mississippi, North and South Carolina, and Texas. When the tops were pieced, Marilyn Lange from Ypsilanti, Michigan added the finishing touch with elegant longarm quilting. The book and quilts were truly a garden tilled by those who have a passion and love for the needlearts. It would never have bloomed without each and every one of them! What did you learn during the publishing process? Any surprises? It’s a lot of hard work for everyone involved, from the publisher’s team, including the publisher, editor, illustrator, graphic artist, artistic designer, technical illustrator, photographer, marketing, to the author. Someone shared with me along the way that working with a publisher is like having a good marriage relationship. It takes a lot of quality hours, hard work, and good communication. I am extremely grateful for my marriage with Landauer Publishing, and for the exquisite book we produced! Why is the book different from other books currently on the market? 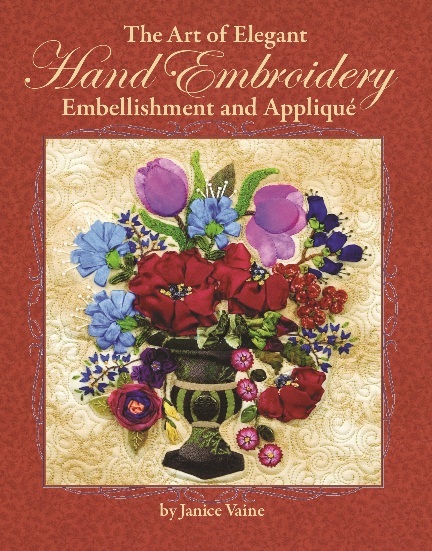 Numerous books on the market focus on single application techniques, such as piecing, appliqué, quilt patterns, embellishing, embroidery, stump work, or ribbon work. 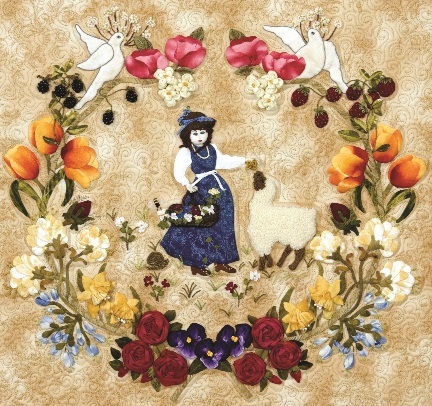 The concept of this book was to combine multiple embellishing techniques into one resource book to offer subtle forms of embellishment to enhance appliqué and/or pieced quilts. The clear line drawings and corresponding text take the reader step by step through each technique, clearly illustrating the stitching process. 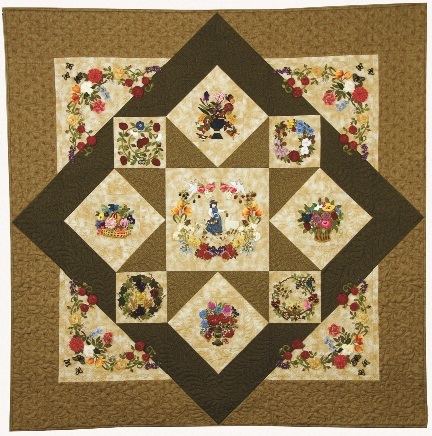 The included block patterns and quilts encourage the learning of these techniques, and inspire creativity by applying personal design and interpretation of the techniques and blocks. The audience for this book is quilters, appliquers, embroiderers, and needle artists of all skill levels. From primitive to Baltimore album blocks, this book will be a resource for learning new techniques as well as for inspiration. It will appeal to quilt shops, needle art shops, and anyone who might like a pretty coffee table book! Tell us something only those reading this post would know. So what makes the book so beautiful? I think a big part of its beauty is Moda’s fabric line, Park Avenue by 3 Sisters. The cover background, each beautiful page within the book, and the quilts themselves incorporated Moda’s beautiful fabric, setting the tone and warmth of the book from beginning to end! Ahhh, how we love our Moda fabrics! So here’s to Moda Fabrics and United Notions for being a part of making my dream come true! With heartfelt thanks and gratitude Moda! THANKS Jan, You are too kind. Jan has also sent me an autographed copy of her book. If you are interesting in owning this piece of art, please leave a comment. I will ask Jan to drae a name at random. I will announce the name on this post, March 29th. Please make sure we have a way to get ahold of you. AND THE WINNER IS >>>>>MIRIAM. Please send me an e-mail with your shipping details. Wow! I can't even imagine producing artwork like this! That is such an amazing and beautiful book. Thank you for sharing the interview with Jan Vaine. What a great interview! The story of how this book came together is a great read on its own. Thanks, Jan, for sharing your process with us, and for coming out with a fabulous book! Thank you Lissa for a great interview. I love that Jan's book is a family affair! I am about to start my first traditional Baltimore Album quilt and a book like this will help me make my quilt something fabulously unique! Great interview and YES this is a book I need in my library for sure! Making a Baltimore Album quilt is a dream of mine. but want to do a very traditional BA quilt one day. Thanks for the book review. I don't use techniques like this nearly as often as I could/should. Adding some pretty stitchery really makes a difference. I'd love to have this book to kick me along. *S* Thx so much for the chance. What a spectacular book. It would be a wonderful addition to any quilt library/stash. Spectacular is the very word for this piece of art! Beautiful and thank you for sharing it! Awesome. What a neat book and so interesting to learn about the creative process behind it. Wow, such beautiful work. I have stitched many things but nothing like that. Another technique to learn….it seems there is always another challenge out there for those of us who like to create pretty things. Amazing! This would be perfect for me! I've been hand quilting for 11 years now but have always wanted to learn how to do hand embroidery. This book looks wonderful! What a great book! I can't wait to see a copy of it at my local store. I've been a big baltimore fan for years, but have yet to complete a quilt. This has defintely inspired me! Team work book, I love it. Could I borrow your team? I agree just to read the book and look at the pictures is a great afternoon or a car ride reading. (while the hubby is driving). Thanks Laurie for a chance to win it, more than likley it will be on wishlist at our local quilt store. I am getting this book! This will be a Lifetime Acheivement Quilt! And what a valuable resource! Wow! I am so impressed. I never knew there were 62 embroidery stitches. I want to start right now! This book is right up my alley. I love Elly and love applique. It looks like a perfect next step for me. Thank you so much for the opportunity to win. What a great review. I'm just getting into applique and this would be great to win! Wow!!! What a lovely surprise!! !